Our laboratory is equipped with the most recent tissue clearing technologies. It allows to perform histological analysis in 3 dimensions to whole organs. The tissue clearing service has been developed to make tissues optically transparent. It allows the internal structures preservation and their permeability to macromolecules. The tissue structure is immobilized in a hydrogel to study biological systems using 3D imaging (confocal microscopy, bi/multiphoton microscopy, Light Sheet Fluorescence Microscopy …). We are equipped with CLARITY™ Tissue Clearing System. The automaton is based on the CLARITY™ system, published in 2013 by Karl Deisseroth and Kwanghun Chung from Stanford University. 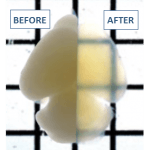 CLARITY™ is a novel technology that produces a transparent tissues by forming a hydrogel network that supports the ultrastructure while allowing for the removal of lipids. Unlike other tissue clearing methods, the CLARITY™ uniquely enables the efficient labeling of tissues with macromolecules such as antibodies and nucleic acids, making high resolution imaging possible. SMA immunolabeling of mouse brain on the left (blood vessels in yellow) and mouse kidney on the right (blood vessels in green). The labeling of extracellular matrix is performed with anti-collagen IV (in red in the two pictures).